Have you heard of the magician Dirk Arthur? It seems that many people haven’t, but that didn’t stop the Riviera Hotel and Casino in Las Vegas from hiring him on as their new act. Has the city already forgotten the horrible accident last decade with Roy Horn and his beloved Mantecore? Dirk is one of only a few performers left around the globe that continue to use exotic animals in their act. He was recently dropped from Caeser’s Entertainment Corporation, ending his shows at the Harrah’s casinos in both Laughlin and Reno, Nevada. 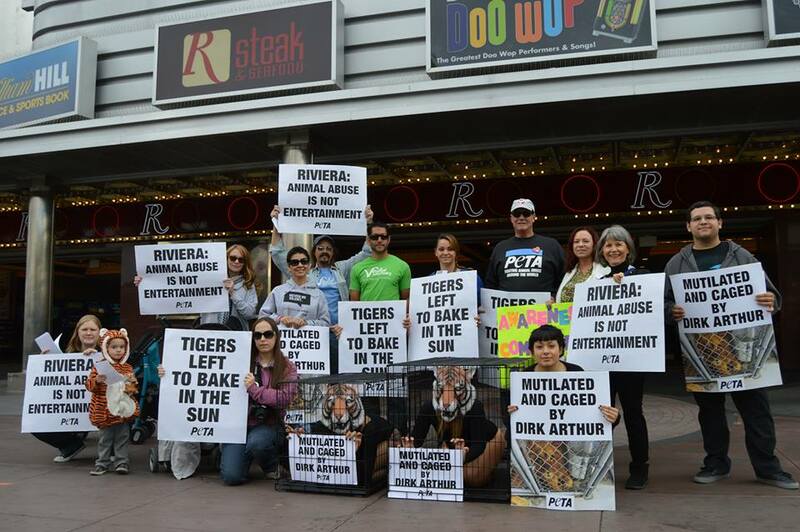 Together, we can push the Riviera to drop his act from their bill. Dirk Arthur says he is for conservation, but he has recently been cited by federal agencies for serious violations of the Animal Welfare Act, including forcing tigers and a lion to undergo a painful declawing surgery. This procedure amputates the last joint on each toe, and is highly frowned upon. He has also kept his large cats in metal cages with no protection from the harsh elements in temperatures over 100 degrees. Activists gathered on Wednesday November 19th outside of the casino on the Las Vegas strip to protest Riviera’s involvement with Dirk Arthur. His show officially starts on December 1st, so local activists have come together to plan a 3 day long public awareness event taking place just feet from the open casino floor. Get together with your family and friends to show your support for the animals who are forced to perform 6 days a week. We will be meeting Saturday Nov 29th: 3:00-5:00pm. Sunday November 30th: 3:00pm-5:00pm. Monday December 1st 5:00-7:00pm. Posters will be provided, but in limited supply. Feel free to create your own. You can also help us raise awareness by dressing in animal costume/face paint. We welcome all forms of your creativity. Call the Riviera box office at 702-794-9433, press 2. Urge the ticket agent to forward your comments to management. 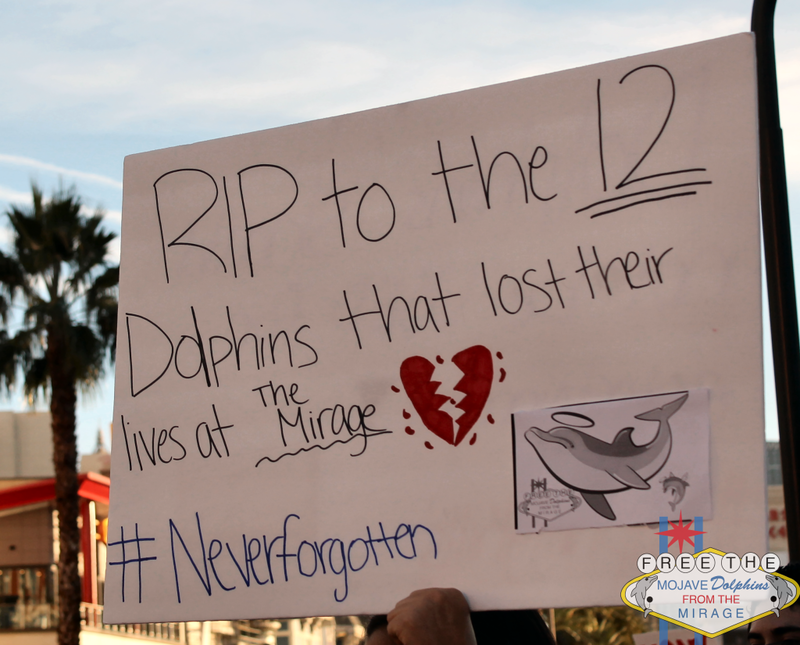 On November 8th, activists from the Las Vegas area gathered in front of the Mirage hotel to give a voice to the dolphins that have died within this facility over the last 24 years. Over 20 people held signs and passed out educational information about the habitat within the casino in the desert. 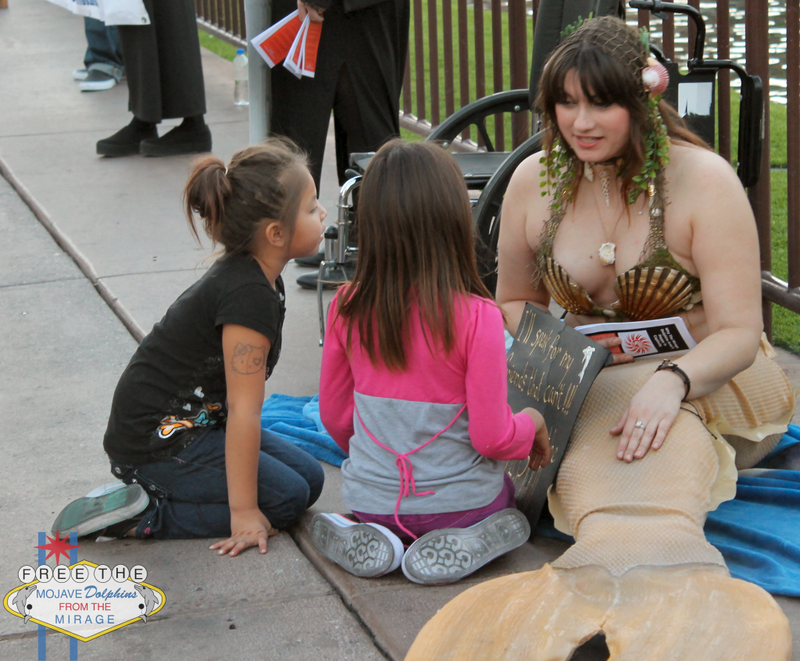 One activist came as a mermaid, and small children gathered around her to listen to the stories of the dolphins. We were able to reach a lot of the vehicle traffic on the strip due to a group of motorcycle stunt riders who got stopped by police, causing a traffic jam for almost the entire protest. Our website logged over 200 hits that day. While some may look at this protest and compare it to last months which had an attendance of over 100 and think we are failing, but that is not the case. The protest in October was a special event with Ric O’Barry where many people traveled from across the country to join in. With every protest, we see return faces, and many new ones. Our local group continues to grow, while online support has gone up by the thousands since May. Our group collected over $80 in donations that will go towards printing up brand new brochures. Our next protest is on December 6th, and our focus is the dolphin “Rascal” aka “Wizard”. He was born at the habitat and died in 2004 after 3.5 years of life. His cause of death has never been released after a decade. We want answers. In January, the USDA issued a formal warning about the way the animals were living. Dirk is one of only a few entertainers anywhere in the world who still choose to use exotic animals in their act. Insurance costs are astronomical, and safety regulations have become extremely tight since Roy Horn was attacked by Montecore on stage during a performance at the Mirage, just 1.2 miles from Dirk’s new stage home. Dirk has performed in the past at Ballys, the Silverton, the Plaza, The Tropicana, and Osheas here in Las Vegas. Earlier this year, he was performing in both Reno and Laughlin. His return to the strip was tainted when proof of his animal abuse came to light. Caesar’s told him to take a hike, so Dirk traveled up the strip 1.4 miles to the Riviera who hired him. His shows start in just a few weeks, and he even plans to formalize a program to take to Clark County School District (and others when he travels) to use his animals to teach school children about endangered species. That may sound good on the outside, but it only further perpeutates the idea that we need to use these animals in entertainment acts to teach our children to care about them and respect them. Contradictory. 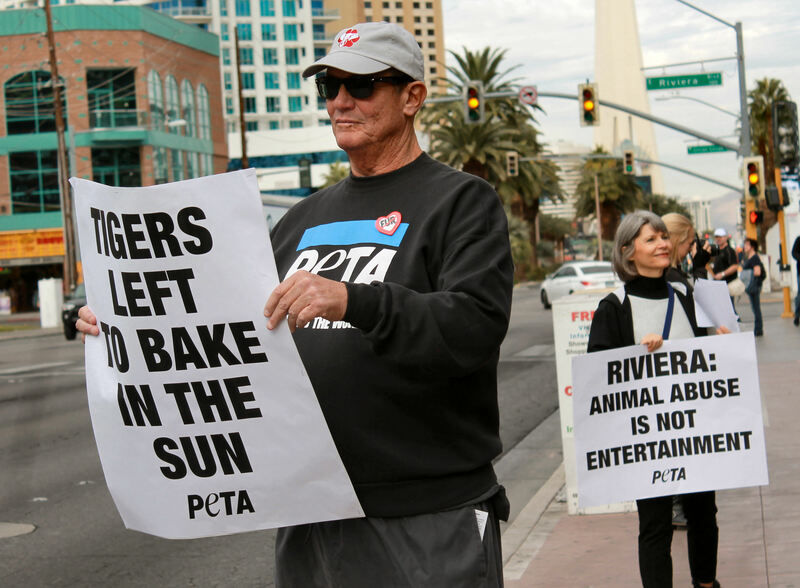 PETA has organized a peaceful demonstration on Wednesday November 19th from 12-1pm outside of the Riviera near the intersection of the Strip & Riviera blvd. Posters and leaflets will be provided. It is important that we continue to stop the exploitation of all animals for entertainment purposes here in Las Vegas.